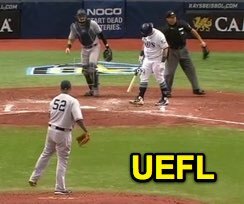 HP Umpire Vic Carapazza ejected Yankees pitcher CC Sabathia and Manager Aaron Boone (throwing at Rays batter Jesus Sucre after warnings; QOCU) in the bottom of the 6th inning of the Yankees-Rays game. With none out and none on, Rays batter Sucre took a first-pitch cutter from Sabathia for a hit-by-pitch. Replays indicate the pitch was located inside and struck Sucre in the left thigh; warnings had previously been issued after a prior inside pitch, the call was irrecusable. At the time of the ejections, the Yankees were leading, 11-0. The Yankees ultimately won the contest, 12-1. These are Vic Carapazza (19)'s second and third ejections of 2018. Vic Carapazza now has 13 points in the UEFL Standings (9 Prev + 2*[2 MLB + 0 Irrecusable] = 13). Crew Chief Jerry Layne now has 7 points in Crew Division (5 Previous + 2*[1 Irrecusable Call] = 7). This is the 178th and 179th ejection report of the 2018 MLB regular season. This is the 87th player ejection of 2018. Prior to ejection, Sabathia's line was 5.0 IP, 0 ER. This is the 73rd Manager ejection of 2018. This is NY-AL's 10/11th ejection of 2018, 1st in the AL East (NYY 11; TOR 10; BOS 5; BAL, TB 3). This is CC Sabathia's 2nd ejection of 2018, 1st since July 7 (Lance Barrett; QOC = Y [Balls/Strikes]). This is Aaron Boone's 4th ejection of 2018, 1st since August 31 (Nic Lentz; QOC = Y [Balls/Strikes]). This is Vic Carapazza's 2/3rd ejection of 2018, 1st since April 17 (Albert Pujols; QOC = Y [Balls/Strikes]).